Past officials at the TSA are concerned about any pre-screening systems that don’t also include a level of randomness. The current system’s inconsistencies do just that. Let’s hope this isn’t lost as it is rolled out to more airports and carriers. It was an eerie feeling to speed through airport security without taking off my shoes, removing my laptop and liquids from my bag or stripping away my belt and suit jacket. In lines next to me, people danced around in socks, emptied their pockets and fed plastic trays through X-ray machines. But for the first time in more than a decade, I effortlessly passed through security. There wasn’t even a line. See, the government now considers me a “trusted traveler.” At many of the nation’s largest airports I can race through security. As much as my mom might tell me I’m special, I’m really not. You too can get such fast-track status if you fly enough or are willing to spend $100. The Transportation Security Administration’s PreCheck program is open to some elite frequent fliers as well as travelers enrolled in one of the Customs and Border Protection’s expedited entry programs: Global Entry, Nexus and Sentri. Just because you are part of PreCheck, it doesn’t mean you get to use it every time. Code embedding in your boarding pass randomly allows you to use the PreCheck lane or requires you to undergo the normal screening. Either way, you get to jump to the front of the line. You still have to walk through a metal detector and bags go through the normal X-ray scan, but liquids and laptops can remain in your suitcase. Belts, shoes and jackets remain on. “Forget everything we’ve taught you for the last 10 years,” one TSA screener in Chicago told me last week. The TSA can also ask you to go through additional screening; on one of my recent trips out of New York, I was randomly selected to have my hands swabbed to test for explosives. The program is now at 16 airports. That number is expected to grow to 35 by the end of the year and will include all of the country’s largest airports. Right now, it is only available to passengers flying on Alaska Airlines, American Airlines, Delta Air Lines, United Airlines and US Airways. And at each airport, not every airline passenger can participate. It’s all about which checkpoints, in which terminals, the TSA has the special lanes. For instance, United passengers flying out of Las Vegas can’t yet use the program but those on American and Delta can. 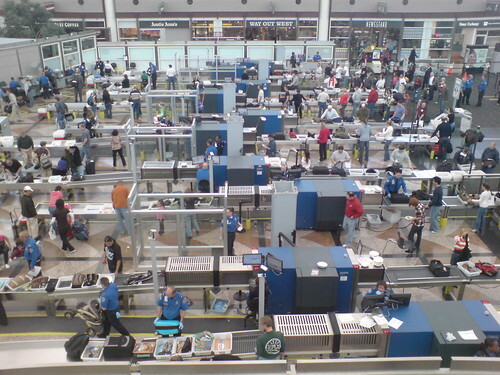 For a list of participating airlines and airports, visit http://www.tsa.gov/what_we_do/escreening.shtm . PreCheck is only good when traveling domestically. To enroll, frequent fliers should opt-in on the airlines’ websites. Eligible travelers will see a box to click on within their online profile, near where their birthdate is stored. The TSA won’t say which elite fliers qualify. But a query of travelers on the frequent flier discussion site MilePoint revealed that some who fly as little as 50,000 miles a year have been able to enroll. Once enrolled, you don’t have to re-qualify each year. However the TSA uses undisclosed means to assess your risk before each flight and might not allow you to use the lane. But you don’t have to be an elite flier to participate. Members of Global Entry or other Customs programs can enter their membership number in the same part of the airlines’ websites. I do have elite status with some, but not all airlines, but recently joined Global Entry, guaranteeing me the ability to use PreCheck when flying most airlines. When arriving in the United States, Global Entry members can skip the regular immigration lines and go to a kiosk. Their fingerprints are checked with a set on file, they answer a few questions posed on the screen and then head straight to baggage claim. Yes, there are a few hoops to jump through, but once you do, you’ll never dread airport security again. You might even leave the checkpoint with a smile. I did.